Older style mobile phones may not be able to use our apps, but they can usually still access the5fish.mobi website and play the audio files. 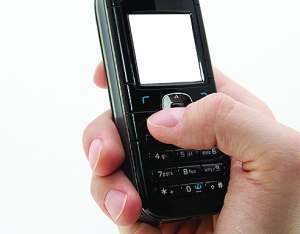 Mobile phones can be effective tools in countries with restricted access. Just imagine that you are sitting in the doctor's waiting room. You strike up a conversation with the person beside you. She is very friendly but doesn't speak enough English for the conversation to go very far. What can you do? Or maybe you have travelled overseas and have a stumbling interaction with a local person. You would love to be able to communicate something significant with them, but can't. What can you do? You can use 5fish! Take out your phone and go to 5fish.mobi (see the end of this article for instructions on how to do this). There you will find GRN's recordings in over 5,000 different languages and dialects ready for you to download and play for that person right now. You can listen together on your phone. It's very likely that the person will be able to download the recording onto their own phone, or you can send it directly from your phone to theirs, so they can listen at their leisure. Once you have a recording on your phone you can share it without internet access. So if you know that you are going into an area where a particular language is spoken, you can download recordings in that language onto your phone. 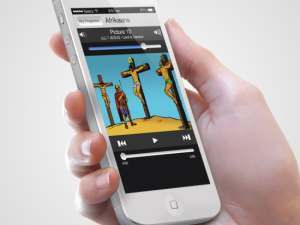 You can then play the recordings or transfer them to other phones without internet access. GRN has developed 5fish so that people can have easy access to the Good News about Jesus in their own language. You will even find English materials there for people who don't read. 5fish. Please pray with us for people who will discover 5fish in different countries and tell people about it. Why do we ask that? Revelation chapter five says that Jesus was slaughtered and by His blood He ransomed saints from every tribe and language and people and nation for God. GRN's contribution to God's plan is to tell the story of Jesus in every language. We want to fulfil our mission as well as we can, and so we want as many people as possible hearing the message. Romans chapter ten tells us that faith comes from hearing, and hearing comes through the word of Christ. 5fish is a new way that people can hear that word. Store. We hope to have an iOS app available soon. (We are looking for volunteer developers to make the app available on other devices). How did 5fish come about? 5fish has been developed by James Thomas (Australian staff member) and an army of volunteers. More recently James has been joined by Franz Brosch (Android developer) and David Nolan (iOS developer) - both are part-time Australian staff members. We are very thankful for everyone who has played a part developing 5fish.